SAN DIEGO – Feb. 28, 2014 – San Diego REPertory Theatre (San Diego REP) presents “Red” by John Logan as the sixth production of the company’s 38th season directed by Michael Arabian. Previews for this six-time Tony Award winning production begin March 29, 2014. Opening night is Friday, April 4, 2014 and runs through Sunday, April 27, 2014 on the Lyceum Stage. The story is set in 1958 at a critical point in the career of the abstract impressionist painter, when Rothko has been challenged to create a definitive work of art for the exclusive Four Seasons restaurant. But he struggles with the threatening presence of a neophyte assistant, who represents a voice of a new generation of artists that question Rothko’s theories and label him a sell-out. Surrounded by massive black and red canvases that pulsate with color, the result is a battle between student and master in search of the highest art possible. This larger-than-life portrait of an angry and brilliant artistic mind is a fearless piece of work that dares to explain the mysteries of creation. “We have heard it said many times that going to the theatre can sometimes have the power of going to church or temple,” says Sam Woodhouse, co-founder and artistic director, San Diego REPertory Theatre. “This play feels like one is participating in a non-institutional spiritual séance. Fascinatingly that the play begins and ends with the same onstage image: Rothko standing staring out into the audience at a painting, trying to hear what it says to him. A painting only he can see because it is living just over our heads in the audience.” “Red” was written by John Logan who wrote the Academy Award-nominated screenplays for “The Gladiator” and “The Aviator.” He won a Golden Globe for his film version with Tim Burton of the musical “Sweeney Todd.” He also co-wrote the recently acclaimed James Bond film “Skyfall” and is slated to write the next two Bond films. About John Logan, playwright, “Red” John Logan received the Tony, Drama Desk, Outer Critic Circle and Drama League awards for his play “Red.” This play premiered at the Donmar Warehouse in London and at the Golden Theatre on Broadway. He is the author of more than a dozen other plays including “Never the Sinner” and “Hauptmann.” His adaptation of Ibsen’s “The Master Builder” premiered on the West End in 2003. As a screenwriter, Logan had three movies released in 2011: “Hugo,” “Coriolanus” and “Rango.” Previous film work includes “Sweeney Todd” (Golden Globe award); “The Aviator” (Oscar, Golden Globe, BAFTA and WGA nominations); “Gladiator” (Oscar, Golden Globe, BAFTA and WGA nominations); “The Last Samurai,” “Any Given Sunday” and “RKO 281” (WGA award, Emmy nomination). SAN DIEGO – Feb. 28, 2014 – San Diego REPertory Theatre (San Diego REP) presents “Red” by John Logan as the sixth production of the company’s 38th season directed by Michael Arabian. Previews for this six-time Tony Award winning production begin March 29, 2014. Opening night is Friday, April 4, 2014 and runs through Sunday, April 27, 2014 on the Lyceum Stage. The story is set in 1958 at a critical point in the career of the abstract impressionist painter, when Rothko has been challenged to create a definitive work of art for the exclusive Four Seasons restaurant. But he struggles with the threatening presence of a neophyte assistant, who represents a voice of a new generation of artists that question Rothko’s theories and label him a sell-out. 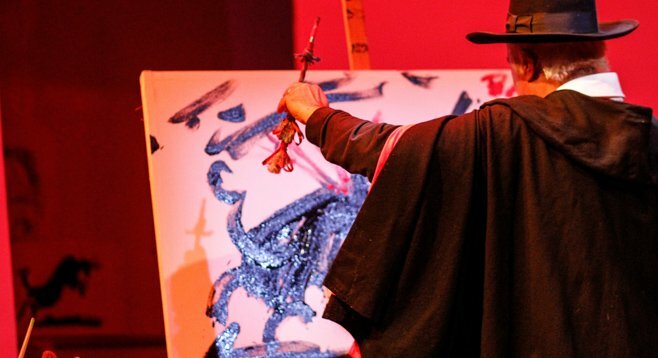 Surrounded by massive black and red canvases that pulsate with color, the result is a battle between student and master in search of the highest art possible. This larger-than-life portrait of an angry and brilliant artistic mind is a fearless piece of work that dares to explain the mysteries of creation. “Red” was written by John Logan who wrote the Academy Award-nominated screenplays for “The Gladiator” and “The Aviator.” He won a Golden Globe for his film version with Tim Burton of the musical “Sweeney Todd.” He also co-wrote the recently acclaimed James Bond film “Skyfall” and is slated to write the next two Bond films. John Logan received the Tony, Drama Desk, Outer Critic Circle and Drama League awards for his play “Red.” This play premiered at the Donmar Warehouse in London and at the Golden Theatre on Broadway. He is the author of more than a dozen other plays including “Never the Sinner” and “Hauptmann.” His adaptation of Ibsen’s “The Master Builder” premiered on the West End in 2003. As a screenwriter, Logan had three movies released in 2011: “Hugo,” “Coriolanus” and “Rango.” Previous film work includes “Sweeney Todd” (Golden Globe award); “The Aviator” (Oscar, Golden Globe, BAFTA and WGA nominations); “Gladiator” (Oscar, Golden Globe, BAFTA and WGA nominations); “The Last Samurai,” “Any Given Sunday” and “RKO 281” (WGA award, Emmy nomination). Michael Arabian is pleased to be making his directing debut at the San Diego REP. In January 2014, he directed “God Of Carnage” at La Mirada Theatre For The Performing Arts for McCoyRigby Entertainment. In 2012, he directed “Waiting for Godot” at the Mark Taper Forum, which won five Ovation Awards out of 10 nominations including best production; five LA Drama Critics Circle Awards including best production and direction; and the Los Angeles Times top 10 list for New York and Los Angeles. Also, at the Taper he directed Beckett’s “Krapp’s Last Tape,” Albee’s “The Sandbox,” Pinter’s “A Slight Ache,” and workshops of new works. Arabian has directed and produced numerous world, west coast, Los Angeles, and New York premieres. His site-specific company, Theatre InSite, formed a partnership with CBS (Radford) Studio first for the Los Angeles theatre, to produce live TV pilots (“Third Rock From The Sun”), inventive, large-scale productions that include an updated “Romeo & Juliet” where audiences followed scenes and car chases through the backlot’s suburban streets, and “The Trojan Women” starring Mariette Hartley, set during the Gulf War and staged in 400,000 gallons of water at the old Gilligan’s Island Lagoon with an amphibious humvee from the Marine Corps. His productions have garnered over 50 awards. Up next, Michael is directing “Six Dance Lessons in Six Weeks” starring Leslie Caron at the Laguna Playhouse in May 2014. John Vickery (Rothko) has worked in local theatres around San Diego since the 1980’s. His theatre credits include playing Romeo, MacBeth, and Trigorin – among others at the La Jolla Playhouse, and as Brutus in “Julius Caesar” at the Old Globe. For the last five years, John has performed at the Stratford Shakespeare Festival in Canada, most notably as the title role in “Titus Andronicus.” Recent Los Angeles appearances include working with David Hare in “Stuff Happens” and Robert Wilson in “The Black Rider.” His Broadway credits include originating the role of Scar in “The Lion King” (also at the Pantages Theatre in Los Angeles); “The Real Thing;” “The Sisters Rosensweig;” “MacBeth” and others. Vickery’s film and television credits include: “Murder by Numbers,” “Big Business”, “Dr. Giggles,” “Patriot Games,” “Rapid Fire,” “Modern Family,” “NCIS,” “Without a Trace,” “Frasier,” “NYPD Blue,” all of “Star Trek,” and many more. Jason Maddy (Ken) is returning to the REP, where he previously performed in “Clybourne Park.” Other San Diego theatre credits include roles with The Old Globe Theatre, Cygnet Theatre, North Coast Repertory Theatre, Moonlight Stage Productions, Ion Theatre Company, Welk Resort Theatre, San Diego Musical Theater, Premiere Productions and Intrepid Theatre Company. Maddy’s regional credits include The Utah Shakespearean Festival, Illinois Shakespeare Festival and Kingsmen Shakespeare Festival. He holds an MFA from the University of Illinois Urbana-Champaign and works with many local schools and theatre companies as a teaching artist, instructor, director, fight choreographer and avid promoter of the arts in schools. Performances are Tuesdays at 7 p.m., Wednesdays at 7 p.m., Thursdays at 8 p.m., Fridays at 8 p.m., and Saturdays at 2 p.m. and 8 p.m. and Sundays at 2 p.m. and 7 p.m.